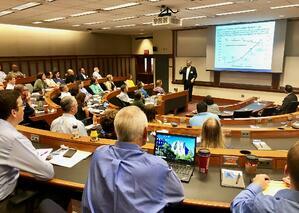 On September 20, Cipher partnered with the Center for Operational Excellence at Ohio State University to host a half-day seminar on Anticipating and Preparing for Disruption. The session was led by Cipher CEO, Peter Grimm, and Director of Consulting, Derek Heiss. With more than 60 participants from the local business community in attendance, this interactive session helped participants improve their capabilities to anticipate disruption and to prepare, ahead of a crisis, for their response. The workshop was also designed to help companies plan for those times when they are the disruptor. Companies of every size and shape, and in every market, are committed to innovation, seeking to capture competitive advantage. This session sought to answer the question, "What can you do when innovation happens “to” you?" Participants worked with Pete, Derek, and each other, to improve their ability to look critically at their own companies’ competitive differentiation and leverage this understanding to more effectively identify opportunities for growth, while monitoring for and predicting potential disruptions. Cipher offers in-person training sessions and strategy support for companies seeking to gain a competitive edge. To learn more about our services or request training for your company, contact us today for a free consultation.